Microsoft has announced its partnership with Flipkart, wherein the latter will adopt Microsoft Azure as its exclusive public cloud platform. The strategic partnership is aimed at providing consumers in India with the best online shopping service in India. 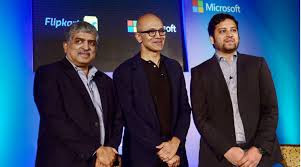 Microsoft CEO Satya Nadella and Flipkart Group CEO Binny Bansal announced the partnership at an event in Bangalore. “At Microsoft, we aim to empower every Indian and every Indian organization with technology and key to this is forging strategic partnerships with innovative companies like Flipkart,” said Satya Nadella, CEO, Microsoft. Flipkart could use Microsoft’s cloud platform as well AI capabilities to provide its users with new experiences. It will enable Flipkart to accelerate its digital transformation in e-commerce, added Nadella. “At Microsoft, we aim to empower every Indian and every Indian organisation with technology through strategic partnerships with innovative firms like Flipkart,” said Nadella on the occasion. As a public cloud computing platform, Azure provides a range of services, including analytics, storage and networking on network of computers (cloud). “By combining our public cloud platform and AI (Artificial Intelligence) capabilities with Flipkart’s services and data assets, we will enable the e-tailor to accelerate its digital transformation and deliver new customer experiences,” said Nadella. "In the last 12 months, 2,000 startups have started using our cloud, and now we are launching a strategic partnership with Flipkart," said Nadella. "I have always admired Flipkart for the work it's done in e-commerce, and is now doing in payments and logistics, and combining Microsoft's cloud platform and AI capabilities with Flipkart's existing services and data assets will enable Flipkart to accelerate it's digital transformation in e-commerce." "Given Microsoft's strong reputation in cloud computing, coupled with scale and reliability, this partnership allows us to make online shopping more relevant and enriching for customers," Bansal added. "Using AI and platform technology from Microsoft, we can improve the experience for customers," Bansal said, adding, "with things like better recommendations. There are other very interesting applications. Take fashion. At Myntra, we have a label called Moda Rapido which is run by engineers. It was created without fashion designers." "Instead, it is data analysis based design, it looks at what people are interested in and based on that comes up with a line that people would buy," he explained. Apart from this, he says, AI, machine learning, and big data are also of relevance for business intelligence. "We have 20,000 to 25,000 people on our supply chain daily, and they are making decisions on the logistics with far reaching impact," said Bansal. "How can we enable them to make better decisions, and better optimise? That's where AI can play a role already."